The Coca-Cola London Eye Private Capsule is the ultimate way to experience the 360° views of London with your friends, family, colleagues or clients. VIP experience- Enjoy a glass of chilled Champagne, in our Eye Lounge, whilst waiting for other guests to arrive, or to extend your experience in an oasis of calm overlooking the Thames. 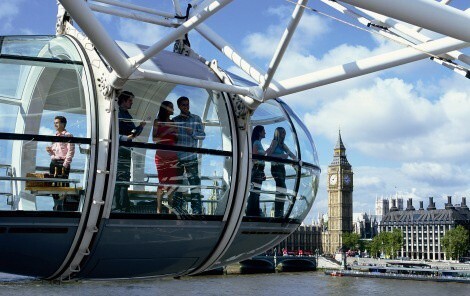 Blue Sky Thinking Capsule- The London Eye provides a blank canvas like no other that is ideal to get delegates and team members to focus on the challenge at hand. This is the perfect break out space for delegates to come up with solutions and solve a problem. The blue sky thinking capsule is great for event huddles, meetings, syndicate rooms, focus groups, team building and think tanks. How about give your team 60 minutes to complete a task? Dining at 135- Dining at 135 is a truly fabulous dining experience for up to 8 guests where the Coca-Cola London Eye will be exclusively opened for you out of hours. The evening begins with a Champagne reception followed by a luxury three-course gourmet meal by Rhubarb Food Design and with fine wine from Layton's wines in an exclusive private capsule on Coca-Cola London Eye.